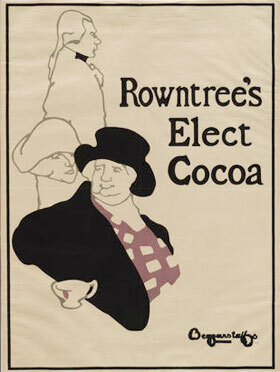 Rowntree's Elect Cocoa poster by J. & W. Beggarstaff, the Beggarstaff Brothers. Founded in 1862 by Henry Isaac Rowntree, H.I. Rowntree & Co. was based in York. His brother Joseph Rowntree soon joined the firm, and in 1887 introduced Rowntree’s Elect Cocoa. Marketed as ‘more than a drink, a food,’ it proved very popular. Soon demand dictated that Rowntree’s move to larger premises so in July 1890, a 24-acre site was purchased off Haxby Road for the modern Rowntree’s Cocoa Works. Ref: Bella 6, Brinkmann 130, Henriot 1353, Sponsel pg 167, Spielmann 268, Hillier pg 109, Malhotra 13, Campbell 1B. Collection, MoMA, New York, NY. Gift of Mr. and Mrs. Arthur A. Cohen (2253.1967). Library of Congress, Prints and Photographs Division, Washington, DC.